According to Fabian Calvo of TheNoteHouse.us, the Fed is printing way more than $85 billion a month to prop up the economy. Calvo contends, “The guys I talk to are in closed door meetings with Fed chiefs, and they’re telling me it’s closer to $125 billion a month . . . the looting of the country is literally happening right now.” Join Greg Hunter as he goes One-on-One with real estate expert Fabian Calvo, whose company buys and sells $100 million of distressed real estate a year. Jerry Robinson is the author of Bankruptcy of Our Nation: Your Financial Survival Guide. In 2010, Jerry createdhttp://FTMDaily.com with a mission to wake up Americans and share with them the principles of true financial and spiritual liberty. Every Saturday he hosts the FTMWeekly Radio, a one hour podcast covering economic and geopolitical topics. Jerry has been blessed to be able to lecture around the globe on the topic of economic and geopolitical trends. He holds a degree in Economics from the University of Tulsa and resides in the beautiful Ozark Mountains with his beautiful wife and newborn son. 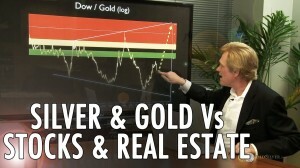 Maloney: Silver & Gold Vs Stocks & Real Estate – Where Are We In The Cycle?